That’s the question I’ve been asking myself recently. For years, marketers have been relying on the exposure approach. It was all about getting your message and product out there and in front of as many pairs of eyes as possible. But, as with any business practice, things change. There’s been a slow but deliberate shift away from traditional advertising. Results consistently show that this quantity over quality approach isn’t all that effective. Successful campaigns don’t aim to distribute a generic message to masses and masses of people to increase brand reach and visibility. Successful campaigns are those that focus on a key demographic. Niche focus and personalization have taken the focus away from the more traditional mass advertising approach. Well, aside from the increase in results it’s all just part and parcel of the evolution of marketing. There was a time when the consumer was wrapped around the finger of the ad man. Those legendary figures who left a legacy of killer campaigns and the best practices that informed them. They were able to get away with anything, including doctors and politicians recommend the health benefits of cigarettes. But before long this approach lost its efficacy. The public became skeptical of the claims made and started to distrust nearly everything that came out of marketing departments. Marketing needed to adapt, and it did so by focusing on brand image. The era of hyperbolic claims gave way to the era of brand image. Businesses wanted their brand to stand for something. For it to elicit a certain feeling in their consumers thus increasing the appeal of their brand and their target demographics loyalty to it. Then we experienced a focus on positioning, messaging that focused on the self-indulgent ’80s market, the integrated marketing of the ’90s and, of course, the modern digital age. And that’s where it gets interesting again. Every change seems huge at the time, but the advent and popularization of digital media have created a turning point for marketing that’s eclipsed all others. Every change in marketing’s history has come about in answer to a perceived shortcoming. There’s a problem and marketing practices evolve to overcome. So what’s the problem with the digital era? What is the major inconvenience that faces the modern digital age’s marketers and consumers. Over exposure, or more accurately, Spam. Consumers are subjected to hundreds of messages every day. Via their phones, email addresses, and paid advertisements to name a few. Marketers abused the hyper-connected era. They spammed prospects at every turn and expected to see a result. But they only caused the opposite. Modern consumers are picky. If they receive anything with even a slight resemblance to spam, it goes straight into their trash folder. Marketers need the solution to overcome this problem. They need to devise messaging that doesn’t look like spam. And so we come to the age of personalization. Personalization is the foundation of a successful, modern marketing campaign. Tailoring your messages to specific demographics ensures you’re not only avoiding a digital spam filter but will also break through your key prospect’s personal spam filter. A personalized message not only gets read but when it’s properly optimized will coerce its target into taking the action you want them to. There have been huge developments in marketing personalization. From the basic addition of a first name to emails to complex triggered emails that respond to certain user actions. We’re in a period where technology allows us to send messages more personalized than ever before. Chief among these technologies is the resurgence of Account Based Marketing (ABM). For B2B companies, ABM is the current best option available for getting targeted messages to your key accounts. Account based marketing isn’t a new idea. It was in fact pioneered in the ’60s. However, thanks to the relative lack of technology at the time, implementing an ABM campaign was difficult, complex and expensive. This put it out of reach for many brands and left it as a campaign only the largest of companies could employ. In recent years, technology has once again come to the rescue. The majority of marketing SaaS businesses now offer some form of ABM solution. Businesses of all sizes are, for a relatively affordable monthly fee, able to implement their own ABM campaign. Why is this important? Because ABM is a personalization and targeting machine! It helps business create timely, targeted messages that can’t fail to resonate with the recipients. It does this by narrowing a campaign’s focus. Instead of targeting an industry or broad demographic group, account based marketing communicates with individual prospects or key accounts as a market of one. When you’re only targeting a select group of people, you can create content and messaging that’s perfectly tailored to their needs. There’s very little guesswork and a vastly reduced chance of missing the mark. Here’s how it stacks up against the current favorite marketing methods. Inbound marketing is the current poster child for better business marketing. You produce useful, engaging content that your target demographic might find interesting and optimize it for search engines. The social shares, referrals and organic traffic it produces provide you with a diverse pool of prospects to pull from. It takes a very wide aim. You’re targeting whole demographic segments which make it difficult to consistently produce messaging that resonates with everyone. Or more accurately, disruptive marketing. It’s called disruptive marketing because, well, it’s disruptive. Your TV shows are disrupted by the ad breaks. Your online article reading is disrupted by flashy PPC ads. And the bane of my existence, telemarketers, manage to call at the most inopportune time and disrupt my life. Disruptive marketing is effective at getting your product in front of huge numbers of people, but it’s also annoying. Many brands manage to curtail this annoyance by creating fun and engaging ads or properly targeting their PPC, but the definition still stands. You don’t watch TV for the ads. Outbound marketing again offers a very wide coverage, but little in the way of effective targeting. This is where things differ. ABM doesn’t have the reach of disruptive marketing or the shareability of inbound marketing. Each message is for a select group of people. It might seem counterproductive at first, but taking such a narrow approach is proven to get results. But these gains don’t come easy. ABM is complicated. You’re going to need to spend a long time figuring out how best to implement a campaign for your business. So, How Does Account Based Marketing Work? How can ABM send super specific content to a small, detailed audience? As mentioned above part of the reason is that ABM focuses on a very small number of people and treats them as an account all their own. Engagio offers the below awesome illustration that succinctly outlines the underlying approach. But what about the details? What’s the outline of the actual practice? The first step to a proper ABM campaign is to identify and target your high-value accounts. ABM is a complex method, and while it has the potential to offer incredible ROI, you want to ensure your results are the best by focusing on key accounts. Use all the data you have at your disposal to categorize and rank your accounts. Look at who has purchased from you in the past and examine how they fit into your future marketing plan. Use all this data to rank your accounts and focus your efforts on the top spots. Use any databases you have access to to populate your newly identified key accounts with the contact information of the key people within that account. Knowing who’s who in your account isn’t enough. You need to fill in as many blanks as you can for each lead and account. Determine business goals, individual goals, challenges, hierarchy and anything else that might come in handy later on. You’ve got your key accounts and have filled them with the best information you can attain. The next step is figuring out how to get your message in front of the right people. Analyze which marketing channels each account prefers, know which products they find most appealing and understand which tactics are more likely to resonate with each account. Knowing this ensures that your messaging can’t fail to resonate. The prep work is done, all that’s left is to put it all into practice. Enable your campaigns and test different messages and delivery methods to see what’s working best. As with any marketing campaign, you’re going to need to keep a close eye on how things are going. Analyze all results across all tests. Look for patterns and identify areas for optimization and improvement. Engagio, one of the leading ABM companies, recommends focusing on the below metrics for an ABM campaign. So, we’ve covered what it is and how to implement a campaign. But we still haven’t answered the question is it right for your business. It’s a difficult question to answer. I can easily sidestep the question by saying that it might be right for your business. After all, every business is unique, and this just might not be for you. But I’m not going to take the easy way out. If you ask me, ABM is a no brainer for any B2B company. Sure it’s a complex method that takes a while to implement, but the gains simply cannot be ignored. But as I’ve already mentioned, it’s still a great campaign to implement for any B2B business. I mean, who wouldn’t want an incredibly high ROI, an increase in revenue, better alignment between marketing and sales departments and a better data set for future optimization? Thanks to the proliferation of easy to use ABM services it’s no longer a strategy for the huge and powerful corporations. There’s been a welcome resurgence in ABM and now is the best time for your business to get on board and implement their own campaign. Is ABM right for your B2B business? I would say yes it is. But only if you’re willing to put in the work for some serious gains. 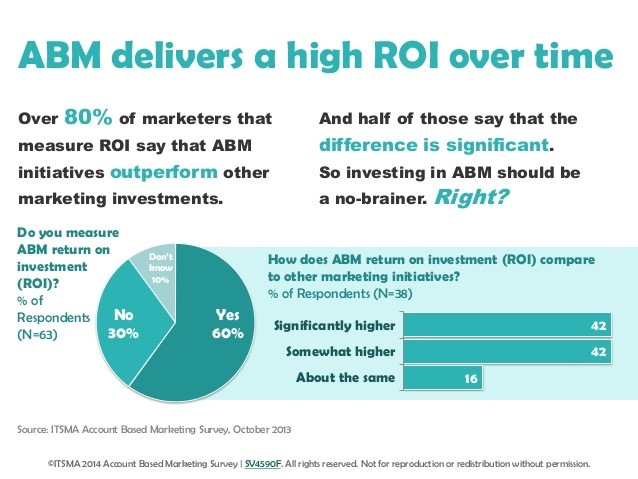 What’s your take on ABM? Do you think it’s the next big thing in marketing or is the current resurgence only a flash in the pan, destined to die out before picking up any real speed?